LASIK eye surgery is the most advanced type of laser surgery used today to correct nearsightedness, farsightedness, and astigmatism. LASIK surgery is also the most common type of laser vision correction performed around the world for patients with these vision problems. It is designed to reduce or eliminate a patient’s dependence on glasses and contact lenses. LASIK is actually an abbreviation for the medical term Laser Assisted In-Situ Keratomileusis, which describes a procedure whereby a laser is used to reshape the cornea from within. The cornea is the part of the eye that helps to focus light on the retina and works similar to the lens on a camera. Light passing through the cornea is bent and focused in a process called refraction. Because the shape of the cornea is not perfect, the light does not focus perfectly on the retina. This blurring and focus distortion is known as a refractive error. The major refractive errors are myopia or nearsightedness (difficulty in seeing distant objects as clearly as near), hyperopia or farsightedness (difficulty in seeing close objects as clearly as those further away), and astigmatism (blurring of objects at all distances due to the irregular shape of the cornea). These problems can be corrected with eyeglasses or contact lenses. However, over time, some people become frustrated with relying on these optical solutions. If you are one of these people, LASIK surgery may be the right answer for you. Our board certified ophthalmologist who specializes in LASIK surgery has been performing LASIK for over 20 years. Since 2007, he has provided All-Laser LASIK to all of his patients using the same laser approved for U.S. Air Force / Navy fighter pilots and NASA astronauts. This state-of-the-art technology along with many years of experience leads to excellent surgical results. This new laser platform – WaveLight FS200 and WaveLight EX500 – is FDA approved for large amounts of nearsightedness, farsightedness, and astigmatism. Prior to scheduling your LASIK procedure, you will undergo a complete eye examination. In addition, your overall medical history will be reviewed to ensure that there are no other factors which would prevent you from being a good candidate for LASIK. LASIK surgery is an outpatient procedure. On the day of surgery, you will be welcomed by a staff member and given booties to cover your shoes and a cap to keep your hair away from your face. Prior to the procedure, numbing drops will be placed on your eye and you may be given a mild, oral sedative. After entering the Excimer laser suite and reclining on the laser bed, your surgeon will carefully place a fine instrument between your eyelids to help you remember to keep them open during the LASIK procedure. 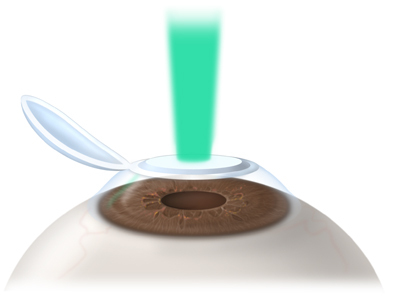 Using a microkeratome, he will then create a very thin layer, a 'flap' of clear tissue in the center of the cornea. The surgeon will then be able to gently fold the flap over and allow the inner layer of the cornea to be visible so that the laser can be applied. The application of the laser can take anywhere from 30-90 seconds depending on the type of prescription to be corrected. The laser and its application time are carefully controlled by a computer. Prior to your arrival, your LASIK surgeon and staff will have programmed the computer with the measurements and calculations gathered from your LASIK consultation. 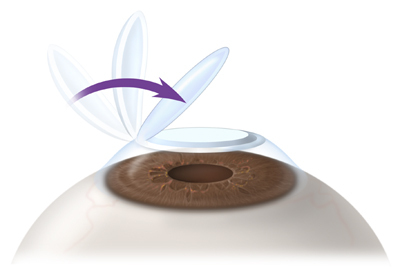 After the laser has been applied, the corneal curvature will have the new shape necessary to correct your vision. Your surgeon can then replace the flap into its original position. The cornea is a remarkable tissue in that it has extraordinary natural bonding qualities. When the flap is replaced, it will adhere to the underlying the cornea without the need for stitches. This makes the healing and visual recovery process very quick and comfortable for most patients. 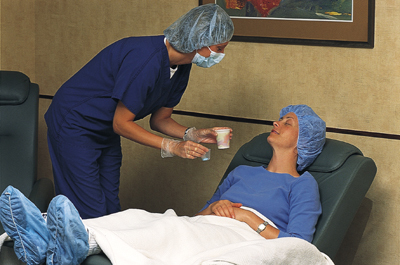 After your surgery, you will rest in a comfortable reclining chair and we will offer you some refreshments. Your family members may then join you in reviewing your follow-up care and schedule. During the first few days after your LASIK surgery, it is important to avoid bumping or rubbing your eyes. It is normal and expected for you to have a mild sensation similar to dryness, but you will usually not be uncomfortable. You will be given detailed instructions regarding eye drops to assist with the healing process, and you should follow them carefully. The night of the procedure, our LASIK counselor will call to check on how you are feeling. The following morning, you will see your doctor so that he can monitor your progress. You will also be required to return for a number of follow-up visits to check the healing process over a period of months. The entire outpatient LASIK eye surgery will take approximately two to two-and-a-half hours, and we will provide you with a comfortable experience. Following your surgery, you will be able to return home. However, you will not be able to drive yourself home. Therefore, you should make arrangements for someone to drive you. Most patients who have LASIK surgery are amazed at how well they see the first morning after surgery. Many of our patients are able to drive themselves to their follow up visit on the morning after the procedure. If you are uncomfortable, though, you should have someone else take you. You can expect to continue your normal activities the next day.